Since Santa Clara lost its Chief Democracy Officer — former City Clerk Rod Diridon Jr. — it seems to have also lost interest in its award-winning voter engagement and Vote Ethics programs. 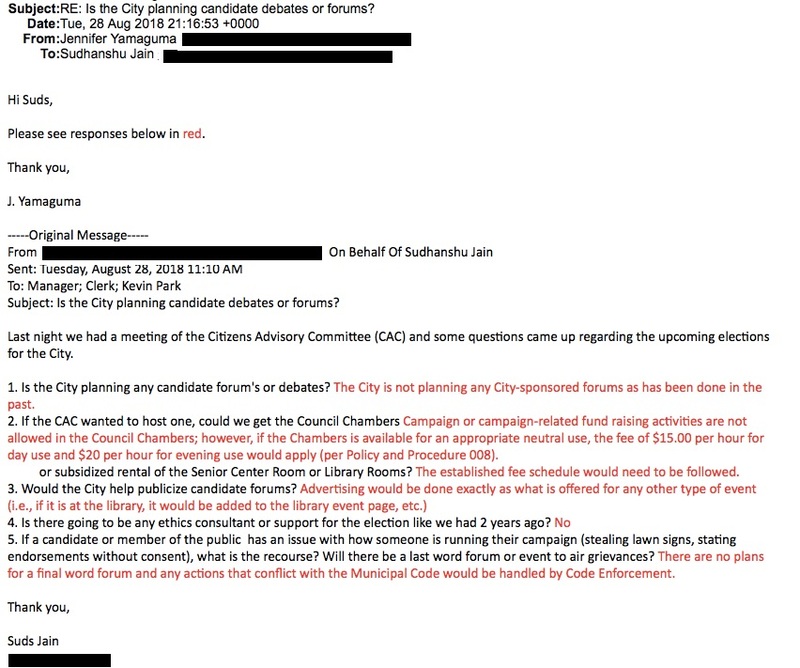 Santa Clara Citizens Advisory Committee Member Sudhanshu Jain recently emailed Acting City Clerk Jennifer Yamaguma asking if the City would provide support for this year’s elections, as it has for many years. 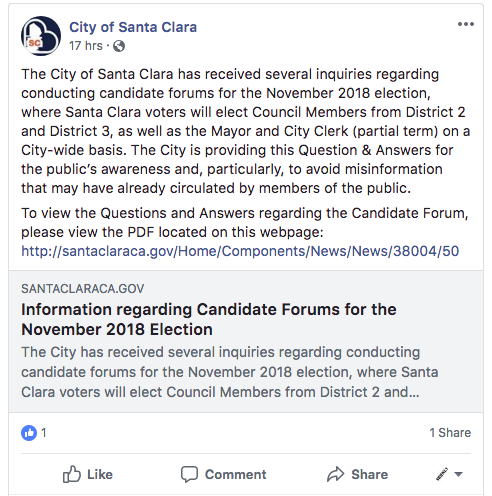 Santa Clara won’t be sponsoring candidate forums. No City venues will be provided for forums unless someone wants to rent them at regular rates, “per Policy and Procedure 008” and the City won’t put out information about any forums. In other words, if your opponent sends a mailer libeling you as a polygamist, too bad. If that mailer doesn’t have an FPPC number, file a complaint with the department that handles complaints about neighborhood eyesores. Santa Clara’s ruling clique is making a last-gasp appeal to preserve its hegemony over City politics by appealing the judgment that Santa Clara’s at-large election system broke voting rights laws. So it isn’t surprising that City officials will do nothing that might encourage voter engagement in a new system that’s likely to remove them from power or hamper historically dirty campaign tactics. It all adds up to another variation on the theme of voter suppression. About three hours after the Weekly published our Editorial Board, the City backpedaled a bit. 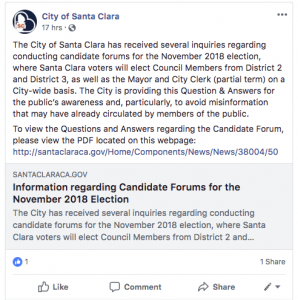 They released a statement to clear the air since so many Santa Clarans shared their concerns about having no City-sponsored candidate forums. See the question and answer document here. Basically, they clarified, almost point for point, the answers Jennifer Yamaguma sent to Suds Jain in the above email. The big take away is that City Attorney Brian Doyle and City Manager Deanna Santana looked into the ways the City of Santa Clara conducted itself in past elections and deemed it inappropriate. Interesting that out of all the many City-hired consultants and richly paid lawyers that are constantly rotating through Santa Clara the City Attorney and City Manager find a City-hired consultant to run a candidate forum — something that is a very popular event — or a City-hired ethics consultant — to monitor the historically dirty campaigns — as the most unnecessary and an inappropriate use of funds. As a side note, readers may notice that the word “neutral” is commonly used throughout the statement. We think this term will get some use in ways that are anything but neutral during this election.